Dunhuang, China -- In the desert landscape of the extreme northwest of Gansu Province are the cliffs of Mogao. Within the cliffs are the 492 natural cells and rock sanctuaries extending over 1,600 meters that make up the famous Mogao Caves. The group of caves is home to an abundance of Buddhist murals, being included among the "three great treasure houses of grotto art in China, together with the Yungang Caves in Shanxi Province and the Longmen Caves in Henan Province. Centuries ago, in a cliff-face in the midst of China's vast Taklamakan desert, artists hollowed, sculpted and painted 492 caves, creating more than 450-thousand square meters of spectacular murals. That is more than 30 times the mural area of the Sistine Chapel. The group of caves later became the world's richest treasure trove of Buddhist art--the Mogao Caves. The construction of the Mogao Caves began in 366 A.D. near Dunhuang, which was an important gateway to the West, a center of commerce along the Silk Road and a meeting place where a diverse mix of people and religions met--including Buddhism. The grottoes were under construction for an entire millennium and reached its creative peaks during the seventh and eighth centuries, when China projected both openness and power. Here is Wu Xinhua, an archaeologist from the Chinese Academy of Social Sciences to tell us more. "Dunhuang was the main hub of commerce on the Silk Road and a major religious center during the Tang Dynasty. A large number of caves were constructed at Mogao during these eras. But the site went into gradual decline and construction of new caves ceased entirely following the Yuan Dynasty, when the Silk Road declined in importance and trading via sea-routes began to dominate Chinese trade with the outside world." The biggest boom of murals being painted at the Mogao Caves was during the Tang Dynasty. Artists brought Buddhist narratives to live on the cave walls with elaborate colors and fine detail being incorporated into their paintings. The unique style of Mogao art is not only the amalgamation of Han Chinese artistic tradition. Ancient Indian and Gandharan influences can be seen in the paintings, as well as the artistic styles of China's many ethnic minorities. The artistic cave complex also serves as evidence of diverse cultural exchanges conducted between China and the West during more than ten dynasties over the course of 1000 years. However, from the 10th Century, Dunhuang's population plummeted and most of the Mogao caves were abandoned. The site remained as a place of pilgrimage until 1900, when Taoist priest Wang Yuanlu discovered the Library Cave by accident. The discovery of the cave, together with the tens of thousands of manuscripts and relics contained within, has been acclaimed as the world's greatest discovery of ancient Oriental culture. This significant discovery provides invaluable references regarding the complex history of ancient China and Central Asia. Here is Wu Xinhua to explain. "The manuscripts from the Library Cave are one of the greatest treasure troves of ancient documents ever found; up to 50-thousand manuscripts may have been kept there. While most of them are in Chinese, a large number of documents are in other languages, such as Tibetan, Uygur, Sanskrit, and Sogdian. The subject matter of the great majority of the scrolls is Buddhist in nature, but it also covers a diverse subject matter. There are also Confucian works, Taoist works, and works from the Chinese government, administrative documents, anthologies, glossaries, dictionaries and calligraphic exercises." The manuscripts provide a unique insight into religious and secular matters of China, as well as other Central Asian kingdoms from the early periods, through the Tang and early Song dynasties. The manuscripts found in the Library Cave include the earliest dated printed book, the Diamond Sutra, from 868 AD which was first translated from Sanskrit into Chinese in the fourth century. These scrolls chronicle the development of Buddhism in China, record the political and cultural life of the time and provide documents detailing the more mundane secular matters of society. All this gives the public a rare glimpse into the lives of ordinary people during this era. There were over 1,000 Mogao Caves during the Tang Dynasty, but there are only 492 caves preserved today. More than half of the frescos and painted sculptures in the 492 grottoes have suffered fading or peeling. Apart from the effects of natural erosion, the unchecked number of visitors to the site has also contributed to the damage. The Mogao Caves can accommodate a maximum of 3,000 visitors a day. However, during the 2012 week-long National Day holiday, as many as 18,660 visited the grottoes each day. Moisture and carbon dioxide emanating from tourists has a direct, negative impact on the fragile colors of the caves' centuries-old murals and painted sculptures. Fan Jinshi, director of the Dunhuang Academy of China, believes it is important to let more people appreciate Dunhuang's ancient artwork, while at the same time acting to conserve and protect them. "We must work to reach a balance between both the caves conservation and tourism management. Collection and conservation are primary concerns, and social aspects like exhibitions and communications constitute the fundamental objective. The objective of conserving the Mogao Caves is to protect and conserve this treasure for posterity." 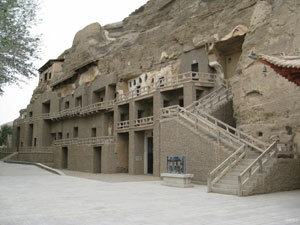 As an answer to Fan's concern, the Dunhuang Mogao Caves Tourist Center is opened to the public. The tourist service center provides visitors with detailed information on the Dunhuang culture. Its dome and digital theaters also help show the caves in authentic detail, minimizing the time tourists spend within the caves. At the same time, more routes are organized at high season, each including representative caves of different eras. Measures are also taken to battle against the natural damage on the caves and the relics they hold. So far, three barriers against wind drift sand have been built, including a 20-hectare grass patch to halt sand, a four-kilometer forest belt and a three-kilometer nylon fence. As the world's largest extant shrine of Buddhist art and a time capsule of the Silk Road, the Mogao Caves were designated a UNESCO World Heritage Site in 1987. They have also engendered a specific discipline -- Dunhuangology--which entails worldwide research on the Mogao documents and grotto art.